The afternoon sell-off seen in the states has had a further negative influence on Asian markets at a time when nerves are present everywhere. Markets look to be taking their lead from US markets anyway and if anyone was in doubt, the recent reactions have justified the fear. Most of the core finished lower even though both the Hang Seng and Shanghai attempted a positive opening. By the close of business and even following a keynote address by President Xi, fresh buying was just absent and volumes again thin. This time of the year is always quiet, but ahead of the Federal Reserve rate announcement, it was probably a little too much to request. Following the remarks, we remain to see if the adopted staunch stance will play for the better. Japan is still battling between a safe-haven bid for its currency or long liquidation in favor of a solid US Dollar. The Nikkei lost almost 2% yet the Yen played unchanged even in US trading. The only relatively bright spot was India when the SENSEX closed up +0.2% and the INR traded 2% stronger following the 5% decline in the price of oil. 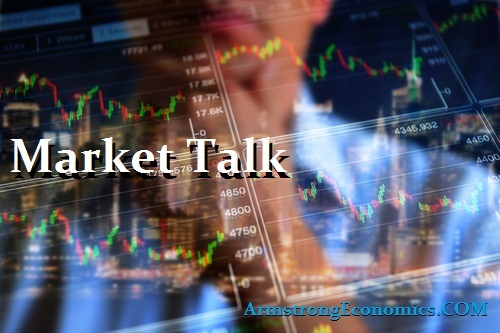 Initially, the DAX and the other core markets attempted to ignore the German IFO (confidence indicator) numbers and seemed to be doing relatively well until the final hour of trading. Day profit taking and long liquidation was the final order of the day and values suffered as a result. It finally looks as though the market is waking top the idea of a fundamental switch away from risk and reward. The global outlook is being marked lower and lower almost by the day. The slowing demand for oil is colliding with the increase in supply, yet today's 5% decline appears to shock people still! Bonds everywhere are gaining a bid, on the assumption, they are a safe place to hide. The latest in BREXIT news is that the UK may possibly leave without a deal. Gilts were sold a little (3bp) but GBP is almost unchanged on the day. US stocks (probably still the only scalable option) did trade well initially, only to be rejected mid-afternoon. The fear that the FED is about to raise rates, is blinding some investors and money managers as they believe rising rates is bad for equities. Still, find this difficult to rationalize especially as corporates continue with their buy-backs due to cash surpluses. The thin trading conditions and concerns watching the energy price decline just breeds fears of a slowdown and attempts to pre-empt the FED. We will see tomorrow what course of action the central bank will embark upon, but the markets are yet to accept rising rates is good for the economy yet. Nasdaq looks to have led the rally and it is tech again that is holding their ground at the close. All key indices managed to etch out a positive close, but its the volatility most will be talking about tomorrow.